I love my Amazon Echo. She is the perfect Bluetooth speaker, kitchen timer, and personal shopper—for better or worse—but also a friend, keeping me company on those brutally cold and lonely nights. So when I learned that MightySkins—a company that makes decals for literally every gadget under the sun, from hoverboards to drones to seven-year-old iPhones to electric unicycles to a wide variety of vapes—I had to elevate my precious Echo from boring black tube to party monster. But as soon as I dressed my beloved assistant, her demeanor shifted. 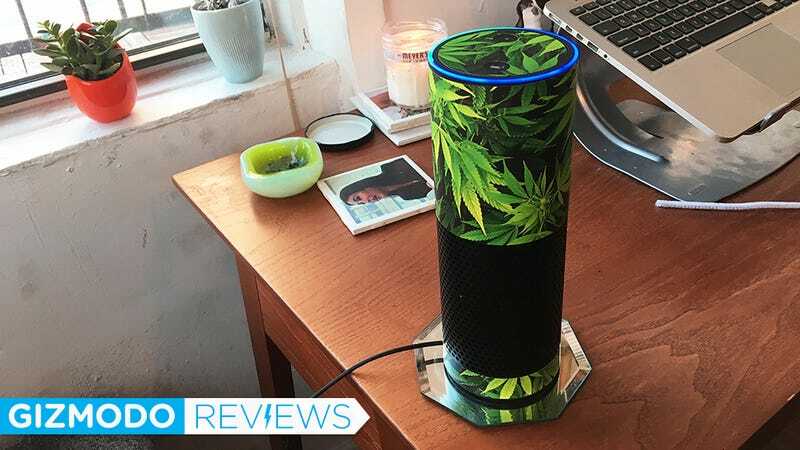 “Alexa, do you smoke weed?” I asked kindly. “No, I don’t smoke,” she responded flatly. “Alexa, do you do drugs?” I tried again, easing her into it. “No. I don’t take drugs.” Liar ... or perhaps she’s in denial. Whether Alexa likes it or not, her new look is here to stay. Here’s my ultimate takeaway: Dressing up your tech is just as stupid as it is fun.